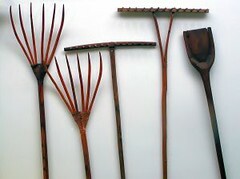 Gardening tools vary from manual to mechanical equipments, depending on the type of gardening activity needed. Applying a landscape to a simple garden makes the whole yard attractive and a nice place to spend time with friends and family members. Although hiring a landscaper is a good idea, creating a personalized do-it-yourself landscape at home is more therapeutic and resource-saver. Some of the basic landscaping tools needed include shears, shovel, lawnmower, wheelbarrow, ratchet pruners, string trimmers, and sprinklers. Shears are needed to tame and control overpowering and twisted shrubbery so they could be made into designs that will complement the whole landscape. The shovel on the other hand, being the most basic tool, is used for digging soils to plant trees, shrubs, and flowers. In some contexts, the lawnmower doesn’t come as a basic gardening tool; however, for big gardens, this equipment is needed to level off and maintain the height of the grass. The wheelbarrow is simply needed to transport soil, seedlings, and other gardening tools from one place to another so it saves time and motion. Pruners are an essential tool to snip trees to control their uncontainable growth so the garden doesn’t look like a messy hoax-forest. Ratchet pruners are specifically designed for this purpose. The trimmer string is basically used for all trimming needs around the house and the garden. This tool comes very handy in the garden. Finally, although not considered as a tool, a sprinkler is certainly one of the basic needs in the garden. It generally waters the whole landscape and backyard so the plants are healthy and well-irrigated. Designing a garden entails both the art and process of crafting and planning a layout of garden and landscape. This can be done by the garden owner himself, or by a professional who is trained and more experienced with the craft. Garden designs and layouts vary from one person’s preference to another. Sometimes in a neighborhood, designing a garden becomes a subtle competition among neighbors. There are certain elements and principles that should be applied and included in designing a garden. These principles are put into place to meet the goals and needs of the owner. The common elements used in garden and landscape layout include walls, paths, water features, decking or sitting areas and plants. Since the garden is also a place where people go for a silent retreat, rest and meditation, creating a good patio or just a viewing deck is also important. Adding a water feature to the garden is always an attraction. Water has properties that can give a feeling and impression of peace and quietness. A water feature can be a small pond or a wall-mounted falls or fountain. However, when including this in the design, it is also important to consider maintenance, sustainability and expenses. Putting enough good lighting in the garden is essential for safety and for additional beauty, especially at night. Garden lamps come in a variety of colors and models for different preferences. Plants are the life of the garden. While other features can enhance the beauty of the whole garden, the plants are the most basic element needed in a garden design. Again, maintenance needs and expenses should be considered in planning what type of plants will be put in the garden. The speed of growth, self-seeding, bloom-time and other characteristics of plants need to be considered as well.